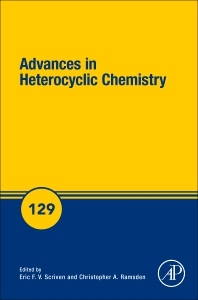 Advances in Heterocyclic Chemistry, Volume 129 is the definitive series in the field—one of great importance to organic chemists, polymer chemists and many biological scientists. Because biology and organic chemistry increasingly intersect, the associated nomenclature also is being used more frequently in explanations. Written by established authorities in the field from around the world, this comprehensive, updated release includes chapters on Metal-Catalyzed Direct Arylation of 1,2-Azoles, The Literature of Heterocyclic Chemistry, Part XVII, 2017, Pyrrolo-, Imidazoquinolines and Pyrroloquinazolines with a Bridgehead Nitrogen, Synthesis and Reactions of Arsole, Stibole, and Bismole, Advances in Synthesis and Chemistry of Aziridines, and more. Eric Scriven was educated in the UK and appointed lecturer in organic chemistry at the University of Salford in 1971. He joined Reilly Industries in 1979, and was Head of Research & Development 1991-2003. He is now Publishing Editor of Arkivoc and is based at the Department of Chemistry, University of Florida in Gainesville. His research interests are in heterocyclic chemistry, especially pyridines. He has over 100 publications and patents in heterocyclic chemistry. He has also published and consulted in the field of technology management. He was a founding editor (with Hans Suschitzky) of Progress in Heterocyclic Chemistry now in its 25th year. He has collaborated with Alan Katritzky and others as an Editor-in-Chief of Comprehensive Heterocyclic Chemistry 2nd and 3rd editions. He has edited two other works, Azides and Nitrenes (1984), and Pyridines (2013). Chris Ramsden was born in Manchester, UK in 1946. He is a graduate of Sheffield University and received his PhD in 1970 for a thesis entitled ‘Meso-ionic Compounds’ (W. D. Ollis) and a DSc in 1990. Subsequently he was a Robert A. Welch Postdoctoral Fellow at the University of Texas (with M. J. S. Dewar)(1971-3), working on the development and application of semi-empirical MO methods, and an ICI Postdoctoral Fellow at the University of East Anglia (with A. R. Katritzky)(1973-6), working on the synthesis of novel heterocycles. In 1976 he moved to the pharmaceutical industry and was Head of Medicinal Chemistry (1986-1992) at Rhone-Poulenc, London. He moved to Keele University as Professor of Organic Chemistry in 1992, where he is now Emeritus Professor. His research interests include the structure and preparation of novel heterocycles, three-centre bonding in the context of the chemistry of betaines and hypervalent species, and the properties of the enzyme tyrosinase and related ortho-quinone chemistry. He was an Editor-in-Chief of ‘Comprehensive Heterocyclic Chemistry III’ and a co-author of ‘The Handbook of Heterocyclic Chemistry, 3rd Edn, 2010.